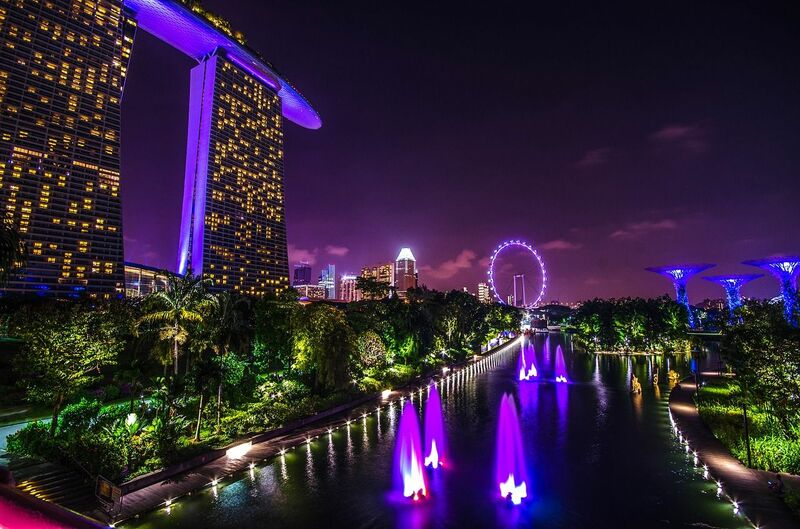 Singapore is without doubt one of the most desirable holiday destinations anywhere in the world. There are myriad things to see and do, activities to participate in, and the city-state is also replete with wonderful restaurants at which to grab some top notch food. Boasting one of the most advanced economies in the world, while also ranking high up on the list in terms of quality of life, it’s not hard to see why so many are flocking to this island city. Planning a trip to Singapore is, of course, very exciting, and a deal to cruise and then stay in this fascinating part of the world is the ultimate way to visit. To help make things even easier for you – as deciding just what you want to do when you arrive can be a little overwhelming – we have put together this very guide, the ultimate guide in fact, to all that must be done while in Singapore. Before we run through our favourite picks, we are happy to be able to bring you a few words from the Singapore Tourism Board, who have their own tips, suggestions and advice to offer those visiting Singapore, along with links to some helpful resources. 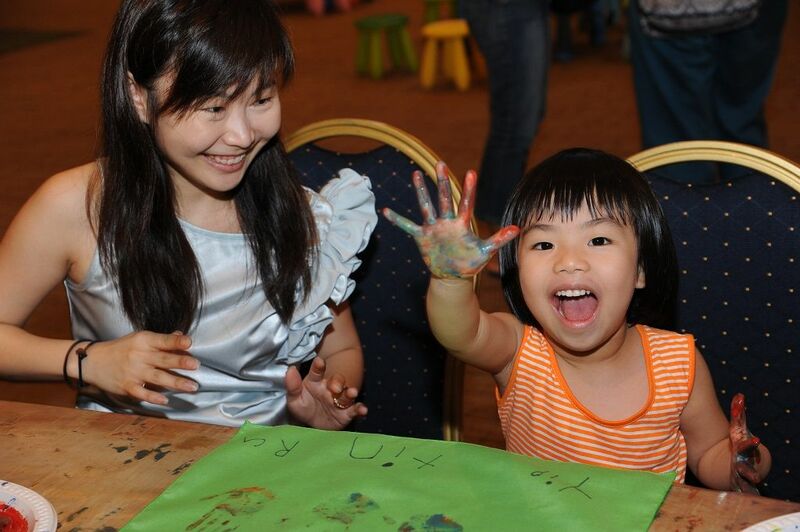 Resorts World Sentosa is a true hub of entertainment and fun activities. You can pretty much do it all at this island resort which includes some of the world’s most famous attractions. We asked Resorts World Sentosa to describe what’s on offer and why it should be on any visitor’s to-do list. “Located on the island of Sentosa, Resorts World Sentosa (RWS) is Asia’s premium lifestyle destination resort, home to world-class attractions including Universal Studios Singapore (which has been awarded Number One Amusement Park in Asia by TripAdvisor Travellers’ Choice for four consecutive years), S.E.A. Aquarium, Dolphin Island, and Adventure Cove Waterpark. With six unique luxury hotels, the Asian flagship of world-renowned destination spas, a casino, and the Resorts World Convention Centre, RWS has been named “Best Integrated Resort” since 2011 for seven consecutive years at the TTG Travel Awards. Home to a variety of stunning plants and flowers, the Singapore Botanic Gardens in the heart of the city is free to visit and open to the public on each and every day of the year. The gardens are managed by the National Parks Board and boast a rich 150 year history. The National Parks Board described to us some of what is on offer: “The Gardens showcase the best and most spectacular of tropical flora, including more than 10,000 types of plants and the region’s most significant living collection of documented palms, orchids, cycads and gingers. Its historic 19th century garden landscape is well preserved and includes the earliest ornamental designed lake in Singapore. Home to numerous heritage trees and a tract of primary rainforest, the Gardens are less than a 10-minute walk from the shopping belt in Orchard Road. A significant attraction for Singapore, the gardens are also listed as a UNESCO World Heritage Site – being the only tropical botanic gardens to make the list. There are a number of insightful guided tours available to help visitors learn about the gardens, as well as a variety of events and exhibitions. The Singapore Botanic Gardens even have a number of walking trails to enjoy – guides for which can be downloaded on their website. And for those who have worked up an appetite while exploring the gardens, there are a number of delicious options for a bite to eat available on site. 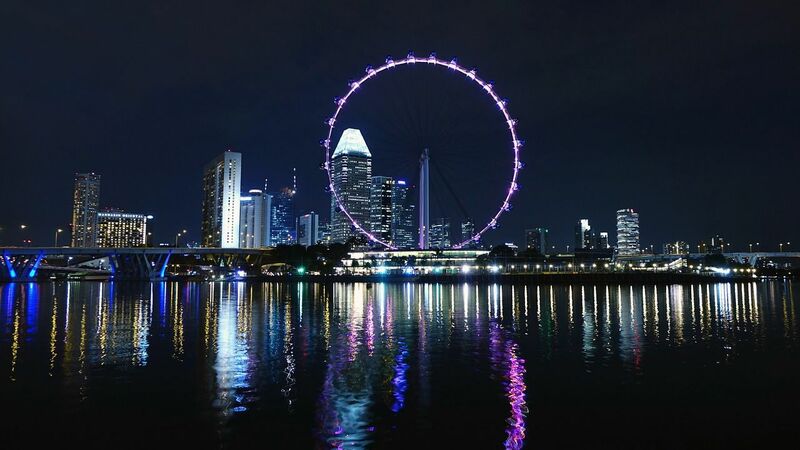 If you are looking for some miraculous views of the city, and want to get a better picture of just where it is that you are visiting, travellers must be sure to take a ride on the Singapore Flyer – a large observation wheel that stands at a giant 541 feet tall. “Singapore Flyer is where you can get the best of both worlds. On the left lies the ocean which greets you with soothing sights of the gentle waves and waters. Catch glimpses of the neighbouring Indonesian Spice Islands and the Straits of Johor, Malaysia while watching the ships sail serenely by. Whereas, on the right, you’ll be treated to a visual feast of iconic and historical landmarks such as Singapore River, Raffles Place, Merlion Park, and Empress Place. “What’s more, visitors get to elevate their flight experience for a uniquely Singaporean touch by upgrading to the Singapore Sling Flight or the Premium Sky Dining Flight which is the World's First Full Butler Sky Dining. Alternatively, they may opt for the Premium Champagne Flight where visitors sip on the finest selection of champagne while taking in Singapore’s spectacular skyline at night. For a truly unforgettable experience during your stay in Singapore, a visit to Haw Par Villa is certainly a must. Located on Pasir Panjang Road, Haw Par Villa is a park with free entry that is home to a stunning collection of 1000 vibrant statues and incredibly visual depictions of Chinese folk tales. 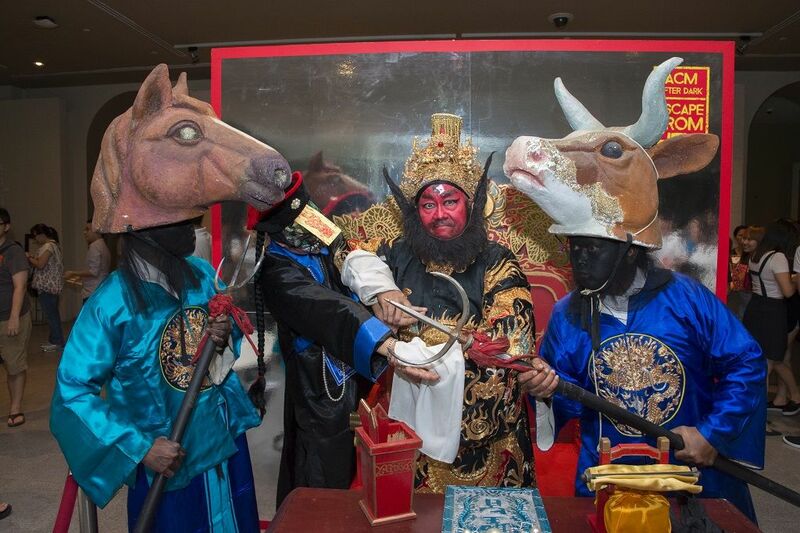 A visit here is a wonderful opportunity to become immersed in the mythology of the land, and is particularly infamous for its rather grotesque representations of Chinese folklore’s ‘10 courts of hell’. There are, however, more family friendly sights available, with wonderful scenes of Chinese legends such as ‘Journey to the West’ and ‘Madame White Snake’. Built in 1937, visitors to Haw Par Villa are destined for a brilliant time with guided tours available for those interested. 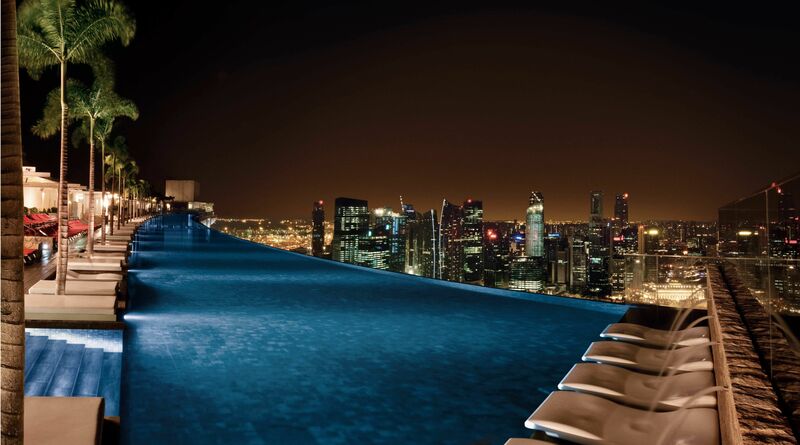 One of the more truly beautiful attractions in Singapore, The Marina Bay Sands Skypark is a jaw-dropping observation deck with an infinity pool that sees paddlers gaze out over the city from 57 stories high. While the pool is only available for guests of the hotel, the observation deck is open to all at the cost of purchasing a ticket. 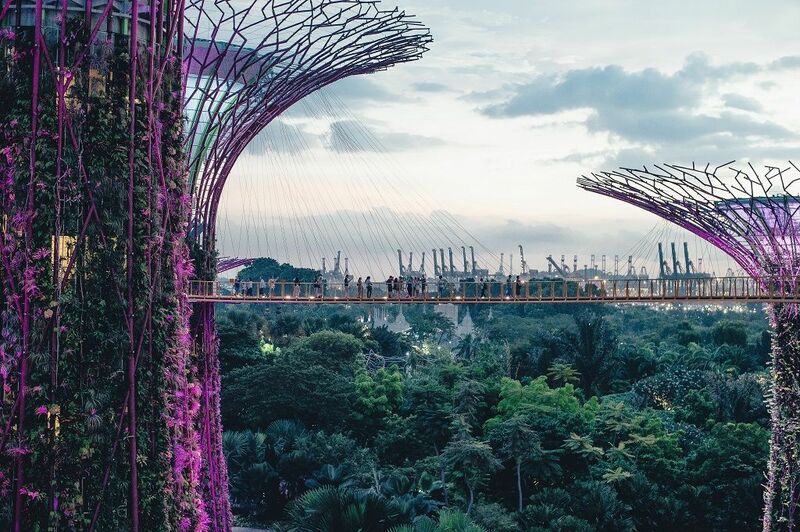 There are some wonderful panoramic views available, not just of the Singapore cityscape but of architectural delights such as Supertree Grove (well worth a visit itself, as we mention later). Whether at morning or night, this is the spot to be perched on for those holiday photographs you will look back on with fondness time and time again. For the animal lovers of the world, Singapore Zoo is an attraction that needs to be on your check list, and has a truly diverse and eclectic range of residents living happily in its confines. A part of Wildlife Reserves Singapore, along with a number of other zoological institutions, Singapore Zoo is renowned for being located among one of the most majestic settings in the world where animals are able to live and roam freely in its open and natural habitats. “Singapore Zoo is known for its beautiful rainforest setting and open concept exhibits where animals roam freely in their natural habitats. Covering 26 hectares, the park is home to over 2,800 animals representing over 300 species, of which 26% are threatened. 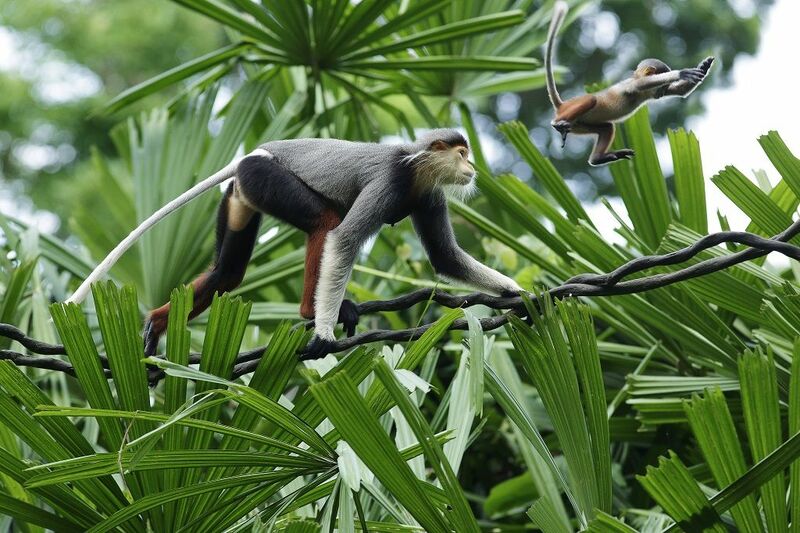 We also asked Wildlife Reserves Singapore to tell us a little bit about the other attractions available. “Besides Singapore Zoo, Wildlife Reserves Singapore has three other parks – Jurong Bird Park, Night Safari and River Safari. “Jurong Bird Park is Singapore’s first wildlife park and Asia’s largest bird paradise. The park aims to enhance visitors’ understanding and appreciation of the colourful avian world through naturalistic exhibits, interactive feeding sessions and world-class bird shows. “Night Safari is the world’s first nocturnal wildlife park. A large part of the park is designed to bring visitors on a 40-minute tram ride through six geographic regions, from the Himalayan foothills to the jungles of Southeast Asia. Through commentary during the tram experience, the park hopes to educate visitors on the importance of wildlife conservation. 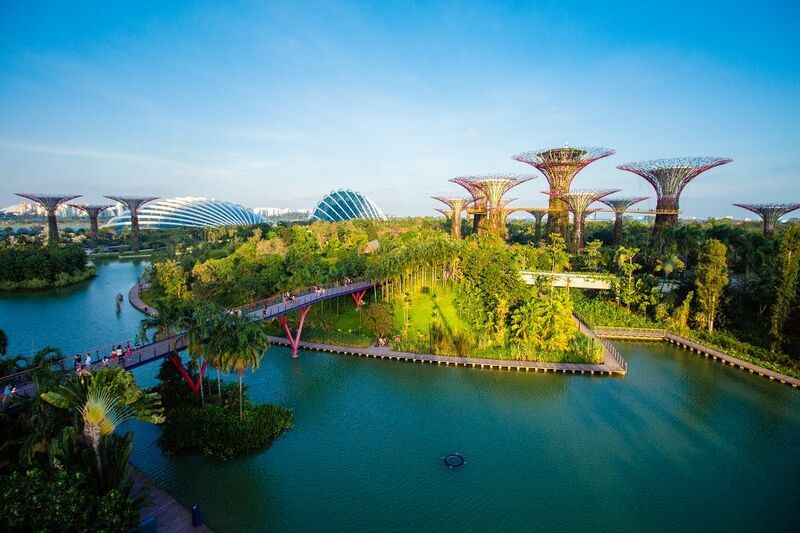 Known as one of Singapore’s premiere attractions and most instantly recognisable spots (particularly the beautiful Supertree Grove), Gardens by the Bay is not just a fun place to spend some quality time but an attraction that aims to be a model for conservation and sustainable development. There is a lot going on at Gardens by the Bay, and we reached out to the popular family destination for a little more insight. “As a horticultural-themed attraction, Gardens by the Bay showcases the plant world in a way that relates to people from all walks of life, and not just nature lovers. There are close to 1.5 million plants from more than 19,000 species and varieties to be discovered at the Gardens. “With its two cooled conservatories, Cloud Forest and Flower Dome, Gardens by the Bay is able to house plants from all over the world – and there is no equivalent in the region. Flower Dome is the largest glass greenhouse in the world, and with its cool-dry climate, showcases myriad plants from temperate regions that otherwise cannot thrive in the tropics. Cloud Forest has a cool-moist climate and houses a stunning 30m-tall waterfall cascading from a mountain covered with plants from the Tropical Montane region. Singapore isn’t just fun attractions and great views, however, as the city hosts a wide range of fantastic dining and shopping options with a legion of restaurants, cafes, shops, bars, and food courts. Let’s take a look. One of Singapore’s most fashionable neighbourhoods is Tiong Bahru, an area replete with awesome shops, restaurants and bars to visit. Bincho is one such establishment – an all-in-one dining concept that is inspired by traditional small grilling stalls. Led by Chef Asai Masashi, Bincho’s signature lunch sets are a delicious option including appetisers, dessert, and a range of traditional dishes. Another lovely spot is Tiong Bahru Bakery, a café with a range of tasty cooked dishes, desserts, breads, and hot drinks. There’s more than just nice places to eat in Tiong Bahru, of course, with wonderful little shops such as Books Actually: an independent bookstore that specialises in fiction and Singaporean literature – an ideal place to stop at for literary gifts for your loved ones back home. We were delighted to speak to the team at Books Actually, who described what helps make their store stand out from the crowd. To help get a local’s perspective of Tion Bahru, we also asked Books Actually to tell us a little more about the area, helping to authentically convey what travellers can expect to find. Nothing says Singapore eating more than sitting down for a nice local dish at one of the city’s hawker centres. 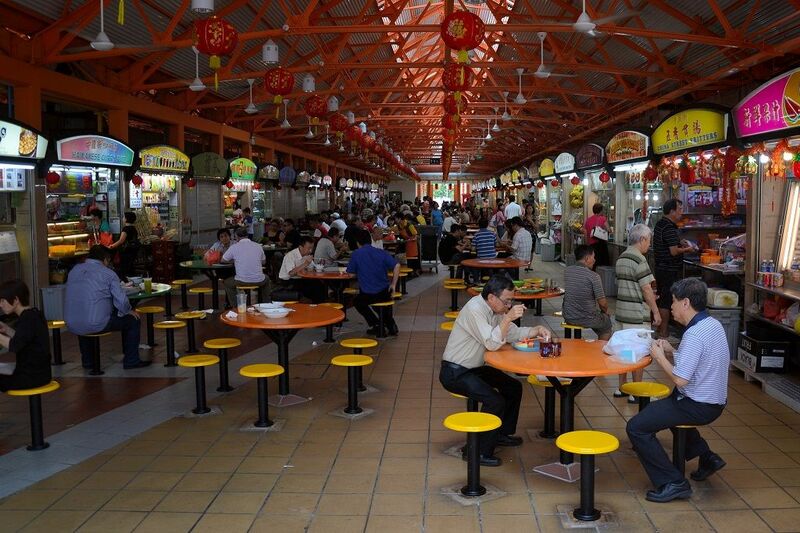 Also known as food courts, hawker centres are immensely popular dining destinations which offer a fantastic variety of local foods such as Chicken Rice, Bak Kut Teh, Satay, Hokkien Mee, and Chilli Crab. Hawkers are very reasonable in price ($2.50 - $5.00) and the quality is top notch as well. There are many courts to pick from, so you won’t be scratching your head for places to find. Some of the standouts include the Chinatown Complex Food Centre and the Maxwell Road Hawker Centre. If you are looking for something altogether different for your Singapore dining experience, then NOX – Dine in the Dark is the place for you. As the name suggests, this isn’t your average dining experience. “NOX - Dine in the Dark is truly a unique restaurant concept and a one-of-a-kind dining experience!” the restaurant told us. “As you dine in complete darkness, you get your senses heightened and rely entirely on your taste, smell and touch to identify the 12 delicious dishes served from our 3-course mystery menu. It is a fun food challenge as you will have to guess what you are eating. The food will only be presented after the meal and you can then conclude whom in your company had the most sophisticated palate. “However, this is so much more than just eating amazing food in a pitch dark venue. During the dinner, you are guided and well taken care of by our blind and visually impaired hosts. This makes the experience such an ‘eye-opener’ as it gives you a glimpse into the world of a blind person. A world where they feel comfortable to orientate themselves around in, whereas you will be struggling. Rest assured, you will walk out from the dining room, not only full and satisfied, but also grateful for having eyes to see and explore the world with. “Eat, drink, sleep and repeat! 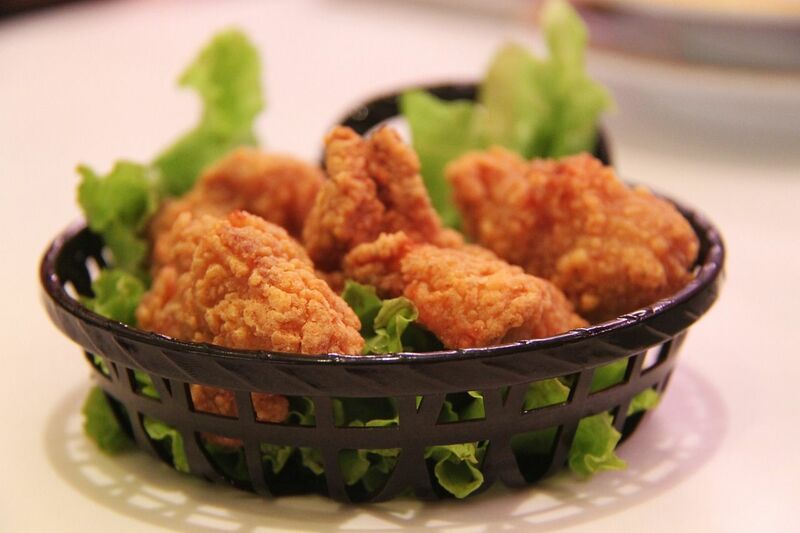 Singapore is well-known for its wide variety of food options. From amazing local and relatively cheap dishes, served up at hawker centres in the neighbourhoods by senior citizens, to Michelin-starred restaurants and swanky rooftop bars in the Marina Bay/CBD area. I love these dynamics of Singapore. For more information on how NOX – Dine in the Dark works, please visit their website. Earlier we mentioned the must-see destination that is The Singapore Botanic Gardens, and inside this location is Chef Jason Tan’s Corner House, a wonderful establishment set in a truly unique setting. This two storey restaurant was built in 1910 and today includes a veranda, reading corner, and whispering corner to enjoy. 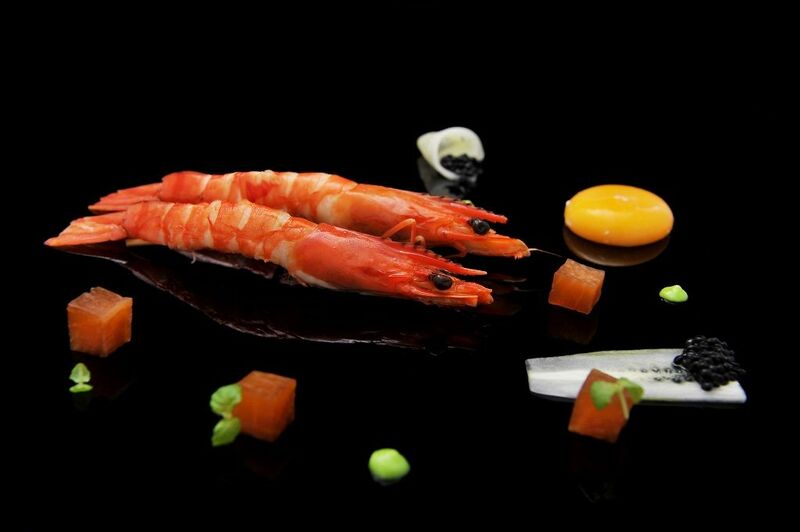 The first-rate cuisine on offer is contemporary in design and complemented by a wine list of over 600 labels. For a superb meal and picturesque surroundings, visitors will be more than pleased by what’s on offer. 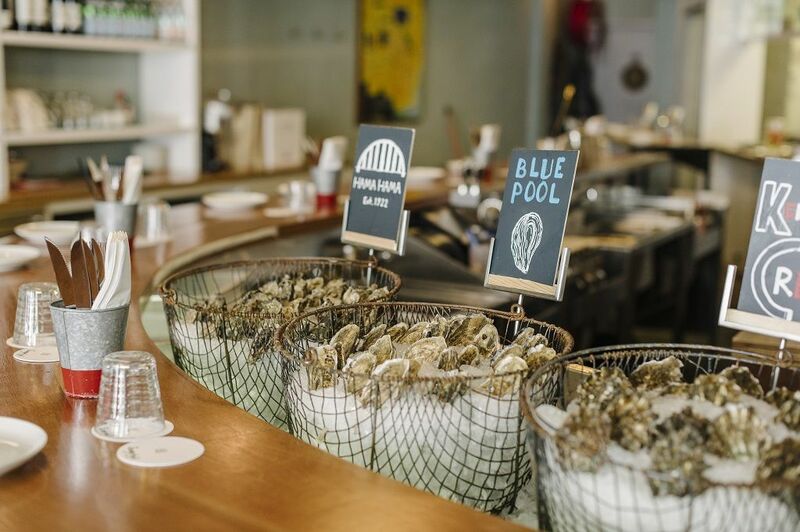 During your Singapore stay you might find yourself in the mood for a spot of oyster or some delicious seafood; if you think that might be the case you will certainly want to head down to Humpback, a friendly neighbourhood restaurant specialising in this area. “Humpback is a place where diners can find comfort, forge friendships, and share happiness” the popular seafood hotspot told us. “The Humpback team and the guests share a warm relationship, one founded on a common love for good food and tasty tipples to go along. We also made sure to ask Humpback for their top Singapore recommendations, in which they chose to highlight Singapore’s thriving cocktail scene. Open Farm Community tries to do something a little bit different in a city as busy and vibrant as Singapore, looking to connect diners with where their food comes from by championing local farming. Located on 35,000 square feet of green-land, Open Farm Community puts local farmers at the centre of their menu, locally sourcing seasonal dishes with ingredients curated from farmer’s markets for an experience unlike any other in the city. After you’ve filled up on all the delicious food Singapore has to offer, there is still plenty more to see and do. Aside from the earlier mentioned attractions to visit, Singapore has numerous historical locations and museums that are well worth stopping by – in fact, skipping town without checking a few of these off will be a crying shame indeed. 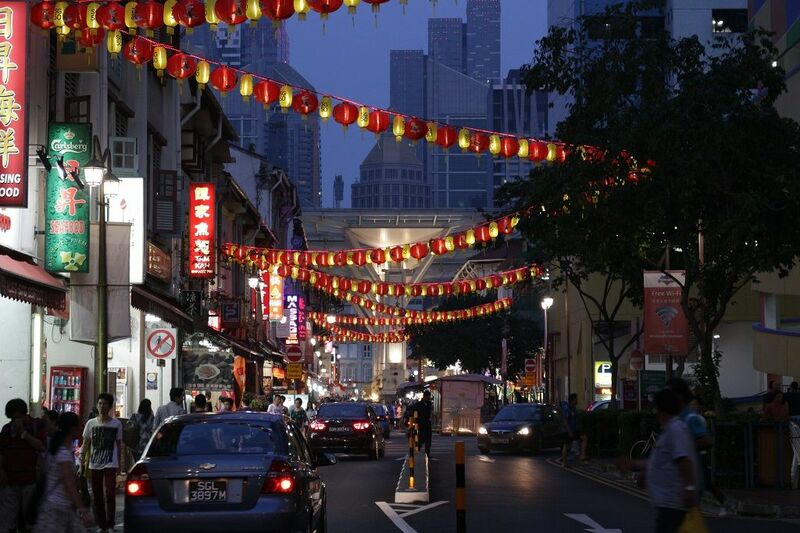 “Chinatown Singapore is strategically located in the central area of Singapore which makes it easily accessible to/from other parts of Singapore. Encompassed by rows of post-war historical shophouses, visitors get to explore Singapore’s oldest Hindu and Muslim worshipping places – Sri Mariamman Temple and Masjid Jamae Mosque – and learn about Buddhism at the four-storey Buddha Tooth Relic Temple all in Chinatown Singapore. The only Chinatown in South East Asia that houses three different religions’ places of worship, this emphasizes our core values of a multi-racial society. “Shop at Chinatown Street Market where it re-creates the street hawking scene of yesteryear with a wide array of Singapore-centric and themed souvenirs, apparels, and Chinese arts and crafts items. Visitors can stop by Chinatown Visitor Centre to get more information about Singapore and Chinatown, as well as purchase discounted attractions tickets and souvenirs that reflect the true Chinese cultural aspects of Chinatown all in the same place. The must visit Chinatown Heritage Centre is the only place in Singapore that has recreated the original interiors and living conditions of its shophouse tenants in the 1950s. The Chinatown Business Association told us that visitors will “be amused by the vibrant heritage-rich Chinese culture landscape rooted in the Chinatown Singapore precinct today,” and highlighted even more exciting options available for those that want to visit the area. Visitors, they told us, can: “grab a free copy of the Map of Chinatown that provides you with directions and an overview of what Chinatown has to offer. For more information on Chinatown Singapore, you can visit their Facebook: chinatownsg and Instagram: @chinatownsg. Originally used as a bunker for Britain’s Malaya Command Headquarters during World War II, The Battlebox has now been turned into a museum with underground rooms that act as a visual representation of the war, showcasing some of its most crucial actors. “This year, the Battlebox has been named the #1 museum in Singapore on TripAdvisor,” The Battle Box informed us, “was awarded the Certificate of Excellence by TripAdvisor, and just very recently, won the Travellers' Choice Award - which is TripAdvisor's highest recognition of excellence and is presented annually to the top 1% of businesses or attractions across select categories. “Visiting the Battlebox gives you a deeply authentic experience where you get to walk through the rooms of the former underground command centre. You will also discover through your professional Battlebox docents, the tactics and strategies that led to the decision to surrender. At the same time, you will also learn about the functions of the different rooms. “One story covers the primary causes of defeat surrounding what British Prime Minister Winston Churchill later dubbed the “worst disaster and largest capitulation in British history” and the other, “covers the roles and functions the Battlebox played in the running of the war, taking visitors to key rooms used by Malaya Command officers during WWII. Both stories are told using photographs, exhibits in the rooms and videos. For the latest news and updates regarding The Battlebox, feel free to stop by their Facebook page. “The Asian Civilisations Museum is the only museum by the Singapore River, located by the historic Raffles landing site. “The Asian Civilisations Museum is devoted to exploring the rich artistic heritage of Asia, especially the ancestral cultures of Singaporeans. Opened in 1997 and in its present building by the Singapore River since 2003, the museum traces its roots to the Raffles Museum, founded in the middle of the 19th century. “ACM focuses on the many historical connections between the cultures of Asia, and between Asia and the world. Singapore’s history as a port city that brought people together from all over the world is used as a means of examining the history of Asia. Special exhibitions bring magnificent objects from around the world to our Singapore audience. Programmes like the annual ACM After Dark, Saturdays@ACM, and Lunchtime Concerts, encourage visitors to connect more closely with the culture and the arts." For more information, visit www.acm.org.sg. There is an awful lot of history on hand in Singapore, and luckily for visitors, its historic landmarks are some of the most visually pleasing in the world. 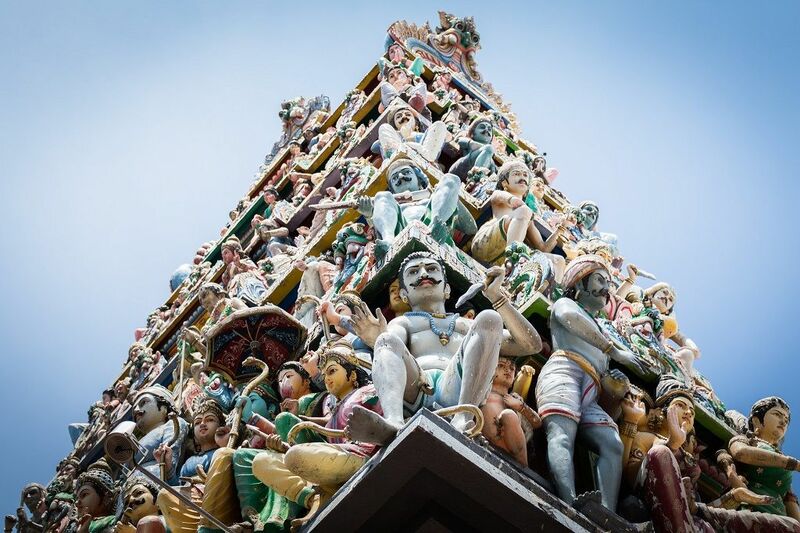 One such location is the Sri Veeramakaliamman Temple, dedicated to the Goddess Kali, boasting some incredibly elaborate and intricate details on its outside and once had acted as a place of shelter during World War II. Located in Singapore’s ‘Little India’, the temple was built more than a century ago by Indian pioneers and became a hub for Indian social and cultural activities. Another precious historic building located in Singapore is St. Andrew’s Cathedral, and is a location that also served an important function during the Second World War – acting as a temporary hospital. These days, it’s a site of worship for Anglicans and opens its doors every day to welcome visitors who want to see its history at first hand and marvel at the impressive architecture on display. And if you are looking to attend a service during your stay, St. Andrews has a number available in varying languages. There you have it, your ultimate guide to Singapore. We hope to have peeled back just a few of the layers to this inspiring part of the world, and that you take on board a few of our suggestions upon visiting the city for yourself.